Editoo’s promise to customers is a professional-grade magazine produced in a short amount of time. Their online tool helps customers create custom magazines for either personal or business purposes, all within a short time and at a low cost. When their web application began encountering high latency as a result of a spike in business, Editoo realized their traditional RDBMS wasn’t capable of handling the increase in traffic. Editoo decided to make the switch to Redis Enterprise as its web application’s session management system. 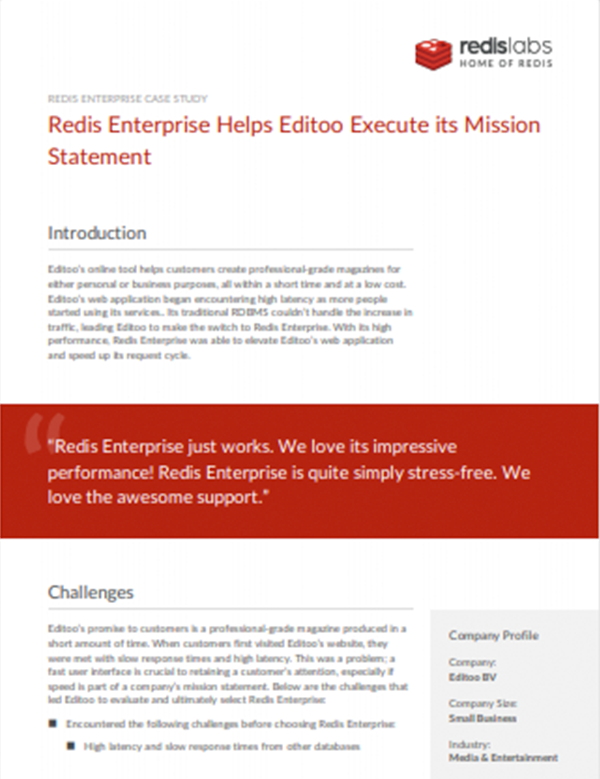 Redis Enterprise was able to elevate Editoo’s web application and speed up its request cycles thanks to its blazing-fast speed and high performance capability. A fast and reliable user interface for its web application that could guarantee high availability in the face of growing application usage. Redis Enterprise just works. We love its impressive performance! Redis Enterprise is quite simply stress-free and we love the awesome support.